LewisGale Medical Center demonstrated a new robotic system for performing spine surgery today. 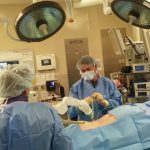 LewisGale is the first hospital west of Richmond with the new “Mazor-X” robotic system. There’s only five in Virginia. After 28 years as a spine surgeon James Leipzig says he is “excited” about this new piece of equipment. LewisGale uses other several other types of automated systems to assist in surgical procedures but Leipzig says this is the first true robot at LewisGale. They’ve used it on several spine operations to date.